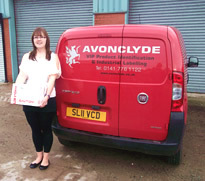 Avonclyde Ltd offer a range of Silver and White polyester sheet labels specifically constructed to print via standard mono or colour laser printers. 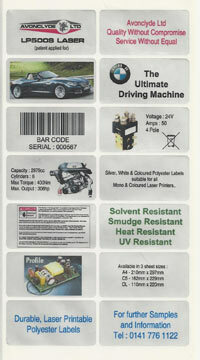 Durability of print is obtained by our unique top coating giving excellent resistance for all harsh environments. 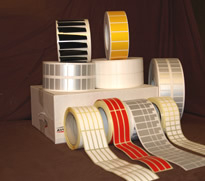 Any label size can be manufactured (there is a wide range of stock sizes, new sizes are subject to a small tooling charge) and can be displayed on three sheet formats. 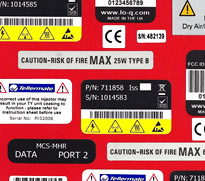 Applications : Rating Labels, Bar Code Labels, PCB Labels, Serial Labels, Warning Labels (Yellow Polyester available), Instruction Labels & Product Labels. 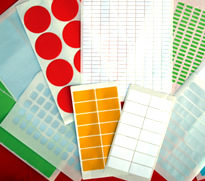 For further information, pricing and samples please do not hesitate to contact us.